In today's post, we will look at a type of pistol that was around in the late seventeenth and eighteenth centuries: the Queen Anne pistols (otherwise called turn-off pistols). These were generally in use from around 1650 to 1780 AD. First, we will investigate the origin of the name. The first models of this type of pistol date back to around 1650 or 1660 AD in England, but they really started becoming popular during the reign of Queen Anne of England (she was born in 1665 AD and ruled England from 1702 to 1714 AD). This is why they are popularly called as Queen Anne pistols. The breech and lock of a Queen Anne pistol were forged together as a single piece, a feature that did not become common in firearms until the middle of the nineteenth century. Unlike most weapons of this era which were loaded from the muzzle, most Queen Anne pistols were loaded from the breech. The barrel of a Queen Anne pistol was screwed on to the chamber. This was one of the key distinguishing features of a Queen Anne pistol. The barrel was tapered from the breech to the muzzle. The caliber of the bullet ball was made larger than the bore of the barrel. Since these pistols were loaded from the breech, there was no need to use a ramrod or wadding, unlike most other firearms of the era. Though early model barrels were smoothbores, later models featured rifled barrels for better accuracy. 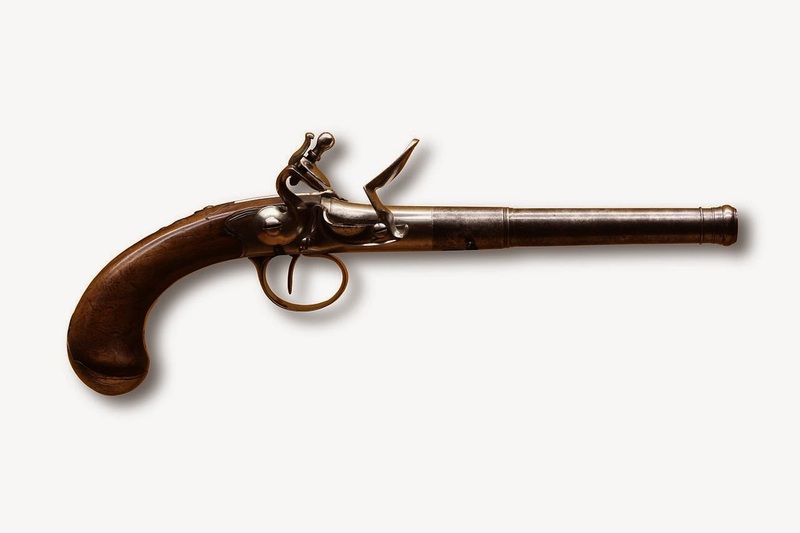 Like most firearms of that era, these pistols used flintlock firing mechanisms. The barrels of most models of Queen Anne pistols were shaped like miniature cannon barrels. A Queen Anne Pistol. Click on the image to enlarge. 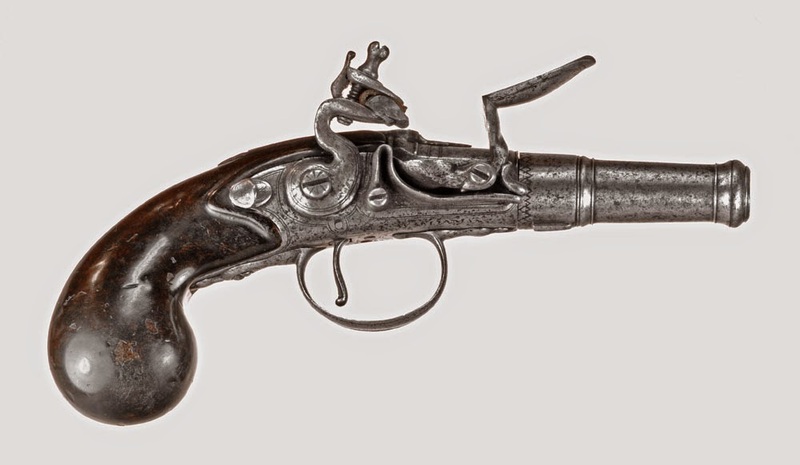 Queen Anne type pistol made by Galliard in Lausanne, Switzerland around 1760. Click on the image to enlarge. Image is licensed under the Creative Commons Attribution-Share Alike 2.0 France license. To load this type of pistol, the user would first unscrew the barrel from the chamber (this is why they are also called turn-off pistols). The chamber is designed to be long and narrow, with a cup on top. After unscrewing the barrel, the user would load some black powder into the chamber and then place a bullet ball on to the cup. Then the user would screw the barrel back in place and tighten it with a key. Notice that the barrel is tapered from the breech to the muzzle. This is a deliberate feature. The diameter of the bullet is larger than the diameter of the barrel at the breech, therefore it cannot roll out through the barrel. The bullet stays in place on the cup and holds the black powder in the chamber, without using any wadding. When the user pulls the trigger, the flintlock mechanism ignites the black powder in the chamber, which burns and produces high-pressure gas in the chamber. The hot gases push the bullet out of the cup and through the barrel. Since the barrel is tapered from the breech to the muzzle, the bullet is deformed as it is pushed out of the barrel. The bullet forms such a tight seal within the barrel that the high pressure gas gives the bullet much more velocity than muzzle loaders of that era. In some early models, the barrels were smoothbore, but later models began to feature rifling in the barrel, in order to improve accuracy. This meant that they had higher velocity and better accuracy than most other pistols of that era. Although some infantry officers carried them for close range fighting, these were not used much as military weapons, because they took longer to load than muzzle loaders and could not be easily re-loaded in the middle of combat. Therefore, the majority of purchases were by civilians. These pistols originated in England, but also spread to France, Switzerland etc. Several of them were used by Americans during the American Revolution. It is thought that most of these came into American hands after the Siege of Boston. The nice thing about such pistols was that most of them were made in sizes that could be easily stowed in a coat pocket, or tucked into a belt, thereby allowing them to be easily concealed. This is why they became popular among civilians as a self-defense weapon. Many were owned by rich people and therefore, quite a few examples are highly decorated with silver and gold engravings. These pistols were also popular with pirates, The infamous pirate, Edward Teach, better known to the world as "Blackbeard", has been depicted in several portraits, carrying a number of these pistols around his body. 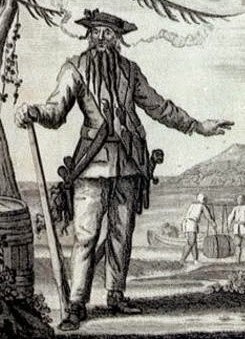 The pirate captain Edward Teach, alias "Blackbeard". Notice the pistols tucked into his belt. The character, Jack Sparrow, in the Pirates of the Caribbean series of movies, also carries a Queen Anne type pistol and hands it to Angelica in the movie, Pirates of the Caribbean: On Stranger Tides. Thanks for an interesting article, I have just looked at the Pedersoli website and they have a Queen Anne pistol with a .50 bore, they recommend a .490 projectile which is 10 thou clearance. Now that's confusing because I am sure that smoothbore breechloaders should have interference rather than clearance, I wonder if there is a guide or a rule of thumb to determine how much interference?